There was nothing he could do except watch me writhe in agony. My broken body, convulsing in the middle of the night tethered between consciousness and hallucination. I heaved for air between spasms of pain, unable to hold down even the water I attempted to drink. Seeing me struggle to breathe, my husband called me an ambulance. Paramedics arrived at the apartment. I could hear their conversation: “Did she drink too much? Does she do drugs? Is she pregnant?” It was a litany of prepared medical questions adapted for New Yorkers at two in the morning, as though those medics had arrived at a nightclub or some kind of high-rise party where the unthinkable occurs. Yet, no, there had been no binge drinking or drug fueled high life. We had just been having Sunday dinner, wine glasses still on our table, candles lit. This was an illness, now ten years old, once more taking a turn for the unimaginable. They picked me up off our floor. I could not feel my limbs. They carried my dead weight onto a rolling bed, into a freight elevator, and rolled my strapped convulsing body simply wrapped in a cotton blanket along a freezing sidewalk, cold piercing my bones. I felt them lift my body into the ambulance. My husband kept calling my name. Lights and sirens blaring and an oxygen mask to my face, we raced up the East Side along a highway we had driven many times before. I was incapacitated, uncontrollably nauseous and barely conscious, but in my delirium envisioned the skyscrapers as we drove past the Manhattan skyline. We headed to an emergency room somewhere near the Brooklyn Bridge. My bed rolled in. As opened my eyes all I could see were bodies lying there lined up along a hallway. A litany of questions were asked of me I could not reply to. They held an iPad for me to sign some kind of consent. I autographed a scribble with my eyes closed. It would be hours before the convulsions stopped. I was on anti-nausea medication, double doses of morphine, and a cocktail of rehydration fluids. Then they had me drink a liter of contrast liquid for a cat-scan at four in the morning. It took four liters to get one into me. Behind my curtain wall a man was lying there, handcuffed hands and feet to a bed, two armed guards by his side. Another had been brought in, a screaming alcoholic who swore at every doctor and nurse in a haunting voice of pain. Then there was the patient who had AIDS, had just left a heroin clinic, and refused to leave the ER because he did not want to go back the streets . My husband stood by my bed. Three nurses attended to me. I asked for blankets. Four times they came with them. They could not warm me. Three times they changed the linens. Six times they assisted with endless nausea. One took vials of blood as another injected something else and third taped an IV to my right elbow. I had ice packs on my head and oxygen flowing into my nose. The first effects of morphine hit and I passed out. A doctor with a polished British accent managed this war zone. Cool and composed some twenty nurses were on their night rounds. Hours later he finally came by to examine me. In my drugged stupor I simply heard him say, “Darling, and how are you?” but I could not reply. It was a typical night in a New York emergency room. I was his easier case. I begged for ice chips, but could have none. By sunrise they had diagnosed an intestinal obstruction complicated by previous surgeries and adhesions related to a chronic condition of endometrial pelvic lesions. I would not be able to eat for days and was to remain still on my bed to help my intestines unwind themselves. Abdominal surgery was the alternative should the blockage not begin to resolve itself. They would move me to the surgery floor, just in case. A friend came that morning — a priest who knew of the night’s struggle. My first moments of clarity were spent praying a rosary which he led at my bedside, as my husband sat there at my feet. We prayed the Sorrowful Mysteries. It was a Marian de profundis. In moments of complete paralysis, words I had spoken all my life seemed the the hardest to utter. Past and present converged on that surgery floor. A synthesis of human pain and medical miracles; hope for hope. Patients were wheeled in and out from the other side of the curtain where I was laying. One was headed to the cardiac unit for an open heart procedure. Another came in having been violently bitten by a rabid cat she rescued from a city street. Each morning they would open her wounds to drain purulence from them, afraid the nerves in her hand would be damaged beyond repair. She would soak her hand in a tub of antibiotic fluid six times a day and four times at night. Sometimes they would drain the bites in her hand at three in the morning. Each time they asked her if she would keep the crazy cat. She kept saying “yes”. It was a New York surgery floor. It was a modern Gethsemane, filled with human agony. There would then be four days of immobility in a bed, IV’s draining packages of ice cold and at times burning fluids into my throbbing veins. I had arrived at that corner of the world with simply the clothes on my back, having suddenly left behind home and personal belongings and the normalcy of dinner on a Sunday evening. My situation remained unknown to anyone but immediate family and some priests my husband had contacted in the middle of the night. I found myself between a hospital curtain and window facing a bilingual sign in Chinese and Spanish that read “Avoid Falls, Call for Help” as machines beeped endlessly and nurses streamed in for more blood draws and vital signs. Family visited in the days that followed. My husband snuck in his dinner nightly and ate it at my bedside. From far away daily calls of encouragement helped pass the solitary hours; unsolicited companionship — the kind of presence which means nothing less than the fullness of life in friendship and love, and became my daily solace in that place of utter desolation. Time stood still. I slept upright in two-hour intervals. I would wake up in the middle of the night in the delirium of fear. I dreamt strange dreams. Every nerve in my body ached. I stared at the ceiling, and muttering partial prayers cried myself to sleep again. Let this pass, O my God. Let this pass. I feared turning to the left or the right to alleviate the soreness that came from days in bed lest a wrong move compromise any possible improvement. Getting up from that bed in the morning to stretch my legs and brush my teeth took forty minutes. The IV port in my elbow had to be disconnected and wrapped in plastic. I had to use my left hand as I was unable to bend my right. My legs wobbled and dizziness hit. I had lost all capacity to care for myself, had been stripped of all signs of normal life — except perhaps for that seersucker robe which reminded me that, after all, I was still in New York, lying in a hospital which wrapped its patients in seersucker robes. All was fear and darkness. The hours were bound up in sadness, confusion, anxiety; the interminable stillness of time in a crazed city — a slow death to self. It was the third day. It was time to try to eat again, or drink my food again as it turned out. A tray of jello, apple juice and chicken broth arrived. I refused it, but was given no option to do so again later that evening. The trauma of drinking had never struck me before — the fragility of the human body and what it needs to do to live another day. By the fourth day, I was made to learn like a child to eat solid food once more. This time a banana appeared. Alongside it, a grayed over boiled egg on a massive plastic tray covered with a thermal cover. A slip came alongside: “Special diet: gluten-free, 516-B”. It looked like some bewildering installation at the Whitney: “Egg on Tray, 1963”. Christ took the subway that morning. Another priest arrived as the nurses left me, vials in hand. He carried a stole, a pyx containing a consecrated Host, a corporal. The corporal would displace the horrid Whitney installation and return decorum to that bedside table. The curtain that divided me and the woman with the cat-ravaged hand became as the temple veil — modern altars, lives the altar linens, souls as tabernacles. Christ came to me that day and made of my heart a cathedral. In the preceding days He had passed by in His priests, and on that day he came to that surgery floor in His Flesh — first food for a broken life. Somewhere there the incense rose, a Sanctus intoned. 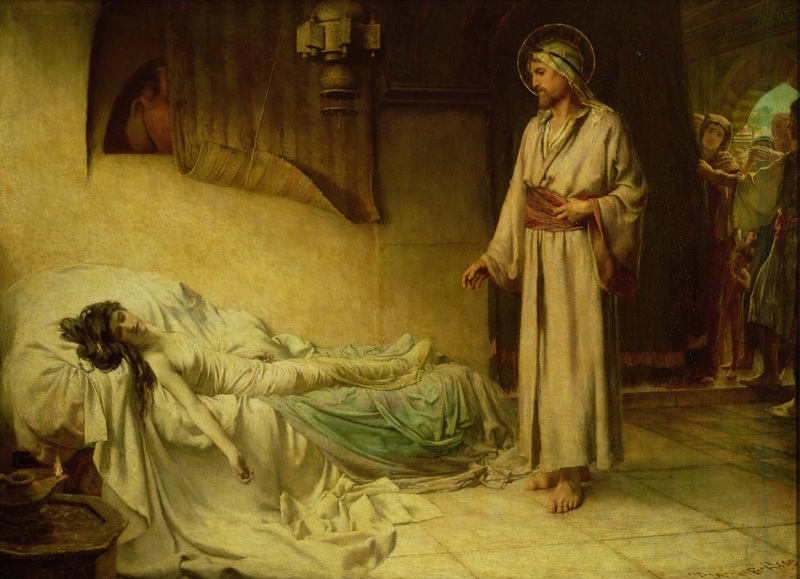 For all the times I have walked up an aisle to receive the Precious Body of Christ, and for all the times I have uttered Amen before the holy Host, never before had I realized as at that moment, lying there on a hospital bed incapable of much beyond that simple assent, how total in that moment of Holy Communion is the human freedom of faith. Should all else be broken and lost, still so we can assent to grace. Still, we can choose to believe. Still, we can love Christ in the Flesh and receive Him in ours. Holy, indeed, is the communion that awaits. The marvel is that Christ continues to pass by. Christ came to the ER and the surgery wing — a Corporal Mercy. He passes by on the subway, even as He still waits in the shuttered tabernacles of the world. He walks among the throngs of hemorrhaging wounded and passes by those fettered to beds incapacitated by illness and disbelief that they might lean forward and reach for the hem of His robe. He visits in men who have consecrated their lives at His altar, that through their consecrated hands those most in need might yet be able to touch Him, to receive Him in the Flesh. Christ passed by that day. He gave Himself to me to eat — Word fulfilled. His Flesh and His Blood. Bread of Angels. Incarnate grace. I stared still at that sign that stared at me: Avoid Falls, Call for Help. In the night, as the spirit and the flesh were weak in that agony of desolation, I had cried for help. He came. …“Why do you make a tumult and weep?” The sorrowful mysteries are turned glorious; the fallen, restored to life. I awoke. I had something to eat.